Although it may be shocking in today’s world that is smartphone-centric, yet it is true that everyone doesn’t need a smartphone which has the latest gestures, apps or a continuous stream of Facebook feeds. Seniors are still falling behind when it comes to using the latest smartphones with the best features. They are still just in need of a phone that just helps you receive and make calls. However, the good news is that there are different smartphones in the market today which are entirely focused on the entire community of senior citizens and retirees. The buttons of these phones are larger than the normal ones, they have emergency dialing and functions like speed-dialing. Are you still not sure about which one is the best one for your family member? Check out the list of smartphones mentioned below. Something that we love about iPhone 6S from Apple is its instinctive software which makes it even more popular among the seniors. All those who are not pretty used to using a touch-screen phone can also find it easy to navigate between email, messaging and apps within a very short time. Its display is 750X1334 pixel, 4.7 inch display which makes it simpler for the seniors to read through texts. It has got a 16GB storage but if your senior keeps clicking selfies, you may need some extra space. While it is true that the seniors won’t ever drain off the batteries of their smartphones using Instagram and Twitter as fast as the younger generation, but it is still necessary to keep them powered. This ZenFone 3 Zoom has high capacity 5000mAh battery which delivers awesome battery life. Seniors have already reported to get 3-4 days of usage without having to recharge. This phone runs on the Android Nougat 7.11 and it hosts 3 cameras, 2 12 MP cameras at the back and 1 13 MP camera in front. With a large screen of 5.5 inch, the user-friendly smartphone is a lovely choice for the senior citizens who wish something with something extra while receiving the basics. This phone features the 5Star Urgent response integration and simple Android software. The display of this phone is extremely sharp and bright and it has got a decent view from different angles. The phone offers large font apps and app icons for the seniors to navigate quickly. The Jitterbug Smart also offers a loud speakerphone so that old people with hearing aid can also use this phone. 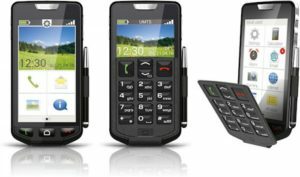 The Alcatel A383G runs on the prepaid network of Tracfone, Big Easy Plus and it is a device that has been created keeping in mind the seniors that have a bright keypad, 3G connectivity and large font. The overall connection of the phone is also better as compared to other 2G networks which are used by other seniors. The keyboard is located at the bottom of the device with keys that are well-lit. Tracfone also offers a bonus car charger which is even better for the seniors who require travelling throughout the day. Snapfon is a name which isn’t going to ring the bells with the conventional phone buyers but the device is also designed o be the best device for the seniors. The display is 320X240 and 1.8 inches overall. It offers a nice color and there is an optional charging dock which supports 1000mAh battery for 4 hours of regular battery life. Therefore, if you’re someone who wants to gift your senior a nice smartphone to make him smarter, you can definitely choose any one among the above mentioned list.